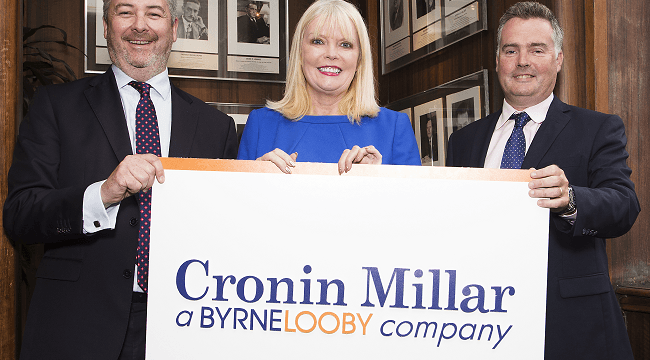 Minister for Jobs, Enterprise and Innovation Mary Mitchell O’ Connor has welcomed ByrneLooby’s (BL) acquisition of Cronin Millar Consulting Engineers and BL’s 2020 strategy which aims to create 100 jobs across its business support and engineering disciplines. Cronin Millar, based in Co Cork, specialises in the planning and design of ports and harbours, further strengthening BL’s marine capability to service the growing Irish and international marine development markets. “I am delighted that ByrneLooby is expanding their operation and creating 100 new jobs in Ireland. It is great to see an Irish company develop and expand its operations creating highly skilled jobs. It is an exciting time for the company as this announcement will strengthen their marine capability enabling the company to service the growing Irish and international markets in marine developments and continue their growth. I wish Michael (Looby), Adam (Cronin), and the team every success for their future”. ByrneLooby (BL) has been a member of Geoscience Ireland since 2012 and employs over 150 staff internationally, including highly skilled designers and project managers. BL has completed several infrastructure projects across the Gulf since 2009 when they first entered the market and now has offices in Abu Dhabi, Bahrain, Dubai, Doha, and Jeddah. Its UK projects are supported by its office network in London, Guilford, Manchester & Belfast.